The iconic Uneeda Biscuit boy in his yellow slicker and rain hat holding a tin of biscuits. Original oil illustration was created by Frederick Stanley as a framed board painting. The image was the corporate symbol of the National Biscuit Company and is recognised as one of the one of the most famous advertising icons in the world. The iconic Uneeda Biscuit Boy icon, was used in the first American national advertising campaign ever for any product. Philadelphia advertising agency N.W. 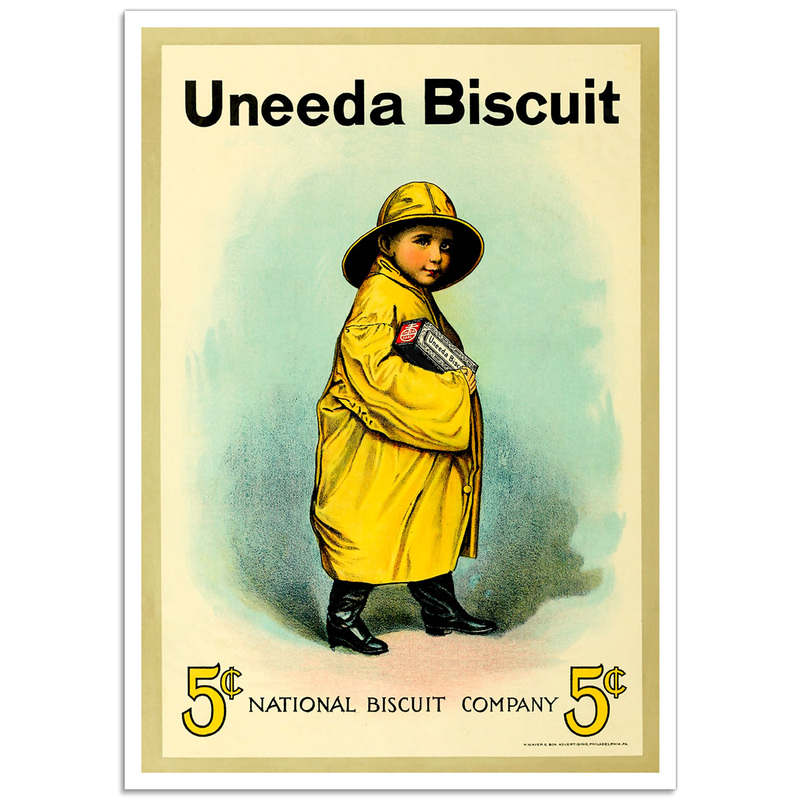 Ayer and Son created the "Uneeda Biscuit Boy", the illustration of a wholesome little boy holding a box of Uneeda Biscuits, wearing a rain slicker, rain hat and rain boots to demonstrate the moisture-proof nature of the package. The UNEEDA Boy became one of the first early American trademarks . The "Uneeda Biscuit Boy" print is a reproduction of a vintage poster. A4 [210 × 297mm], A3 [297 × 420mm], A2 [420 × 594mm], A1 [594 × 841mm] and A0 [841 × 1189mm].